For the 700 kW (kiloWatt) Power Plant in 2009. At PHOTON’s 2nd PV Thin Film Conference, FRV (was Fotowatio Renewable Ventures) Sr. Vice President for Project Development Mark McLanahan presented “The FRV Case Study with CIGS” (Copper Indium Gallium diSelenide) for the solar array located at the Global Solar Energy, Inc. manufacturing facility in Tucson, Arizona USA. First, I noted the plant size was listed as fixed tilt, 700 kW (kiloWatt) in contrast to reports confirming a 750 kW system capacity after my post, Global Solar Energy 750 kiloWatt CIGS Solar Field Live? The solar power plant has been operating for just over two (2) years and is an optimal site from an O&M (Operations and Maintenance) perspective getting lots of attention from FRV and Global Solar. Despite the below average irradiance in 2009, the system still exceeded expectations. 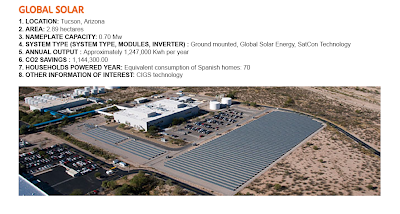 The drop in summer production was attributed to the hot Tucson weather; the CIGS temperature coefficient characteristic observed was “not unlike” crystalline silicon. Yet annual production exceeded expectations by three percent (3%). High temperatures were offset by a good O&M program including module cleaning, very high system up time, and modules performing as expected. 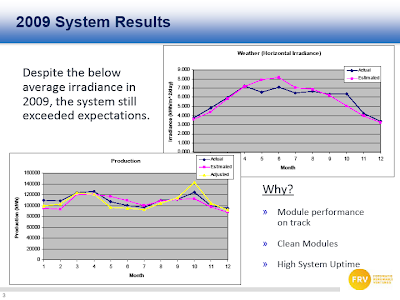 We are pleased to see FRV’s confirmation of the excellent performance and reliability of Global Solar’s CIGS modules. We utilize the field to power our CIGS production line and are confident that the field will continue to produce reliable power for decades to come. Per “Global Solar Energy Appoints New CEO”, Dr. Britt moved from CTO to CEO upon the retirement of Michael S. Gering as President and CEO from Global Solar although he was said to remain Chariman of the Global Solar Board. The only thing that matters really in Project Finance is Bankable return. It is a very high confidence in your IRR, and a very good understanding of the production characteristics, the credit of the offtaker, and the O&M expectations including regular maintenance, unplanned maintenance, and insurance. FRV is not interested in being an early adopter though they do want to look at new technologies if bankable warranties and guarantees can be arranged. These are crucial for large projects. A key thin film project concern is picking the right module brands with strong balance sheets or insurance product backing or both enabling them to weather the PV market consolidation of 240 existing thin film companies over the next few years. As speculated, a broad module market recall could be fatal to a thin film company with shaky finances. Global Solar Energy 750 kiloWatt CIGS Solar Field Live? Nice post, Ed. I wonder if the discrepancy in the installed capacity of the system–750KW vs 700KW–might be a case of the earlier, larger number being the DC amount and the newer figure AC. The math kind of works for that to be so.